National Apprenticeship Week 2019 (NAW 2019) will showcase all the incredible opportunities doing an apprenticeship can bring - both for individuals firing up their careers, and for employers blazing a trail in their business and reaping the benefits of employing an apprentice. In this daily round up we will feature a selection of events, announcements and good news stories from The Week. There’s still time to get involved, so please download our supporting documents to find out more. 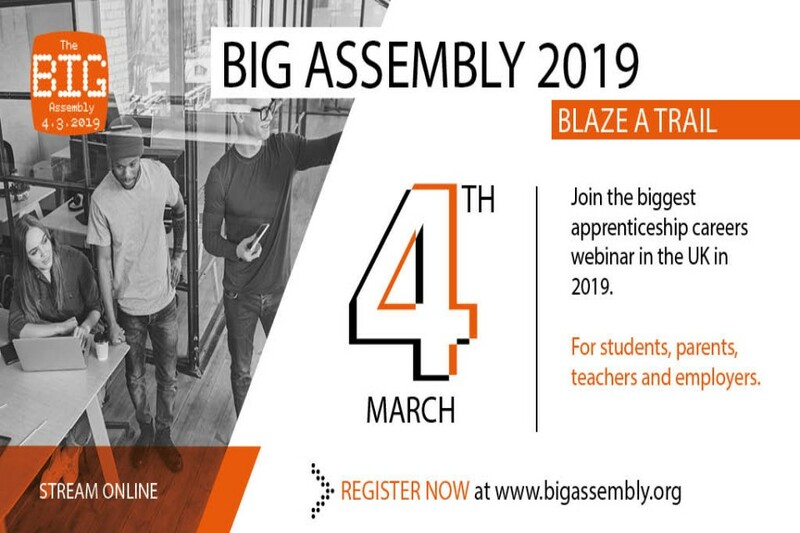 Join in the conversation and share your NAW activities on social media and tag us @Apprenticeships and use the hashtags #NAW2019 and #BlazeATrail. Marking the launch of National Apprenticeship Week 2019 with news of a new league table of top apprenticeship employers - blazing their own trail across England - which will rate the Top 100 large apprenticeship employers AND Top 50 SMEs. A new quality mark for apprenticeships – developed in partnership with Community Interest Company ‘Investors in People’ to shine a light on high-quality apprentice employers has also been announced. We’ve transformed apprenticeships in this country. But that wouldn’t have been possible without the employers who have been at the forefront of developing new high-quality apprenticeship opportunities that provide great training, and the employers who have embraced the huge benefits apprenticeships are bringing to their workplaces. 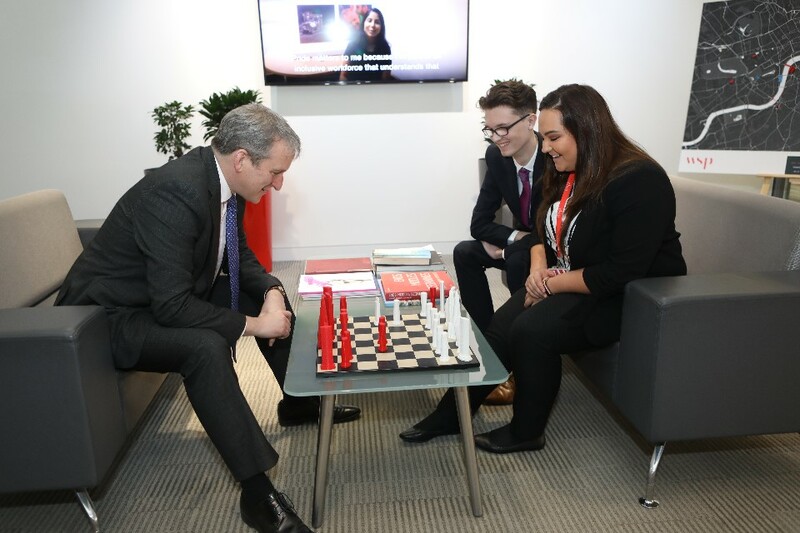 Education Secretary, Damian Hinds, marked the launch of National Apprenticeship Week with a visit to WSP. WSP are one of the world’s leading engineering professional services consulting firms, who currently employ 180 Advanced, higher and Degree apprentices. He met current apprentices and took part in a roundtable discussion, learning more about the WSP programme and their apprenticeship experience. Apprenticeships and Skills Minister Anne Milton MP yesterday visited the North West Ambulance Service, based in Bolton, to meet some of their apprentices in job roles including ambulance technicians, call handlers and paramedics. North West Ambulance Service apprentices met by the Minister are trained to deliver the right care, at the right time, in the right place – giving them an excellent foundation to progress in their careers, whilst making a huge difference to the lives of others. This morning National Apprenticeship Week, #BlazeATrail and #NAW2019 all trended on Twitter. Thanks to everyone who got involved! 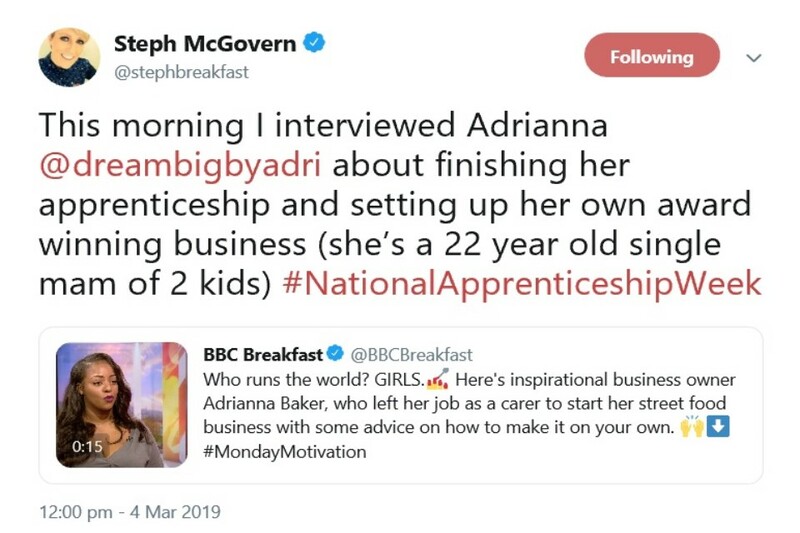 Steph McGovern, BBC Breakfast Presenter, was also tweeting this morning after she interviewed Adrianna Baker, an inspirational young woman who used her apprenticeship to blaze her own trail. Adrianna set up her own street food business, and shared with some advice on how to make it on your own. Supportive coverage from the BBC's Steph McGovern. Thousands of students, parents and careers advisers from across the the country joined The Big Assembly 2019 to find out what an apprenticeship could mean for them. The live video streamed event was hosted by apprentices, and covered topics such as how to apply to an apprenticeship, what the process is like, what it’s like to be an apprentice and what your career holds at the end of the apprenticeship. Fantastic coverage from yesterday’s Media Planet from Apprenticeships and Skills Minister Anne Milton on the benefits apprenticeships bring to employers and the passion apprentices bring to the workplace. Coverage of The Week in Media Planet. Great to see support from employers across Twitter yesterday, with many spelling out how they have benefited from employing apprentices, and their return on investment, using our ‘BlazeATrail’ images. These employers included Hemlow Ltd; Careers in Health and Social Care and Oxford University.